On www.mssqltips.com (Reading SharePoint Surveys and Lists using a SQL Server Integration Services SSIS Package) you can find an updated version of my original post Reading SharePoint List and Survey data using Integration Services package. The updated version on mssqltips describes an easier way of reading the Surveys and Lists data with simplified use of URL protocol an more elegant way of final data extraction using the T-SQL XML methods. Post also contains complete demo solution. Probably you have come to situation when you have a SSIS project with higher count of packages and you need to add for example a parameter or variable to all or most of the packages. Normally you have to open each package and add variable/parameter to all packages one by one and specify all the properties in each package. Using the PowerShell will save you a lot of manual work and tons of clicks inside the SQL Server Data Tools (SSDT) or Business Intelligence Development Studio (BIDS) as PowerShell will allow you to automate the manual work. It’s very easy to manipulate the packages by PowerShell as SSIS packages are pure XML Files and PowerShell has a good XML support. For writing, testing and running PowerShell script I suggest you download and install PowerGUI which has great IntelliSense support and is probably best PowerShell editor available. Also I suggest you to install the Run AddOn which allows you to execute only selected part of script. Also before you start executing the scripts, ensure that you have properly set ExecutionPolicy to allow script execution. You have to run it with elevated Administrator privileges. In this example we will manipulate SSIS 2012 packages and we will add a new parameter to the packages. First thing you have to do is to retrieve list of SSIS package to be processed. This can be easily done by the Get-ChildItem cmdlet. Once we have the list of file to be processed we can start processing file by file using the foreach structure. In this example we will add a SSISTaskID package parameter. $attr.Value = "This is a TaskID"
In the script we are using XPath query to get relevant Parameter Nodes. This can be easily used for locating whatever node in the XML source is necessary. For more details related to XPath you can take a look  XPath Reference on MSDN. I our example we take first DTS:PackageParameters node under the DTS:Executable node. For correct querying we have to use XmlNameSpaceManager as all the nodes in SSIS Package are prefixed with DTS name space. For checking whether the parameter we would like to add exists or not we again use XPath with appropriate filters to find it by Name. So we had to create a PackageParameterNode with CreationName, DataType, Description, DTSID and ObjectName attributes and also with child node Property, which represents default value of the parameter. As each parameter, variable or whatever part in SSIS has it's own unique DTSID property, which is GUID, we have used the [System.Guid]::NewGuid() method to generate unique DTSID for our parameter. Finally once the changes into the SSIS package are applied, it is necessary to write it back to the file system. 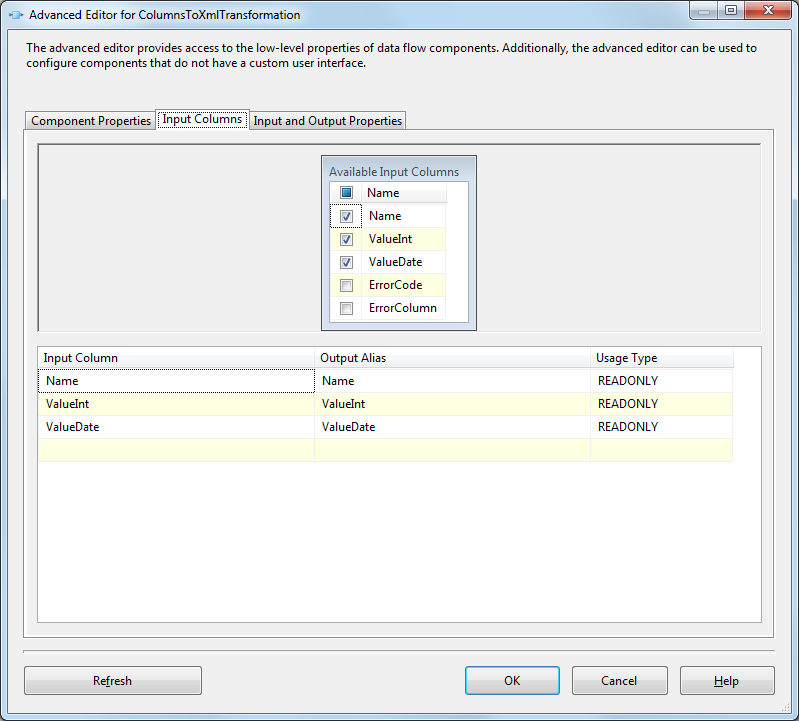 By default the source of the SSIS package is indented and and each attribute is written on separate line. SSIS packages are written in that way to be more human readable and allow an easy processing and comparison by versioning systems. To achieve the same formatting we have to create and use instance of the XmlWriter class with appropriate XmlWriterSettings. As you can see from the script we set Indent and NewLineOnAttributes properties to true. Once the writer is constructed, we can write the package back to the file system. It is also important to close the writer once the saving is done otherwise you will keep open handles to the processed files. As we can see from the example, the SSIS manipulation using PowerShell is quite easy and after a small training with writing this modification also very quick and will save you a lot of manual work if you have to modify a higher count of packages. You can alter the above script slightly to do nearly whatever modification is necessary. This example was done on SSIS 2012 package source, but can be relatively easy applied also on SSIS 2005 and SSI 2005 although the XML source of those packages are not so easy readable as the source of SSIS 2012. 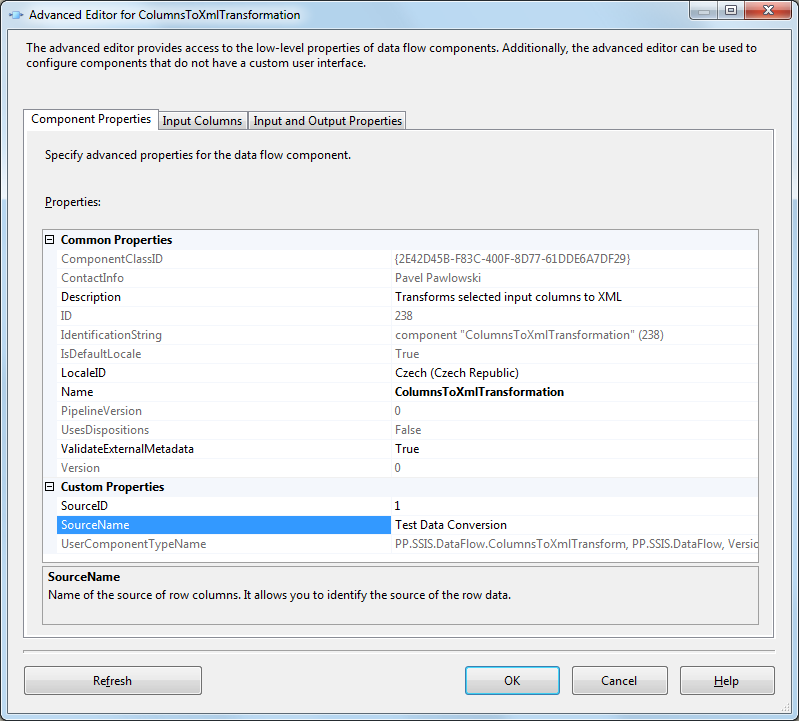 This article represents a custom components for transformation of columns inside SSIS Data Flow into XML. If you are writing ETL processes using SSIS, you many times comes to situation, when you need log errors or other problems which can occur during ETL process. 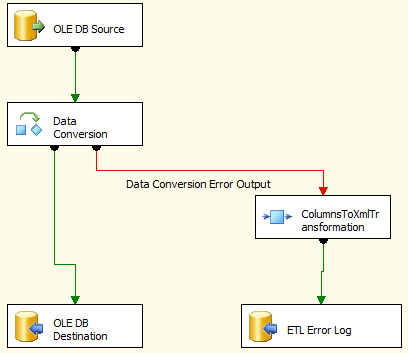 An example can be a failure of data conversion during the ETL process. In that situation you mostly would like to know that record exactly caused that error and log such conversion errors into particular error table. Problem occurs when you have a lot of tables and want to see what data were converted and caused that particular error. As SSIS requires that the sources and destinations needs to be strongly mapped and you have different sources with different structures, this leads to a situation where you have a lot of different error tables – generally one per the source structure at which an error can occur. This situation can be easily solved by a custom Data Flow component which will convert all source columns into an XML. In that situation you can only have one Error Table, which will contain e.g. Error Code, Error Column, Description and an XML Field in which will be all the data of particular row which caused error encoded in XML Form. This rapidly simplifies error logging and also error log monitoring as you need to monitor only a single table. 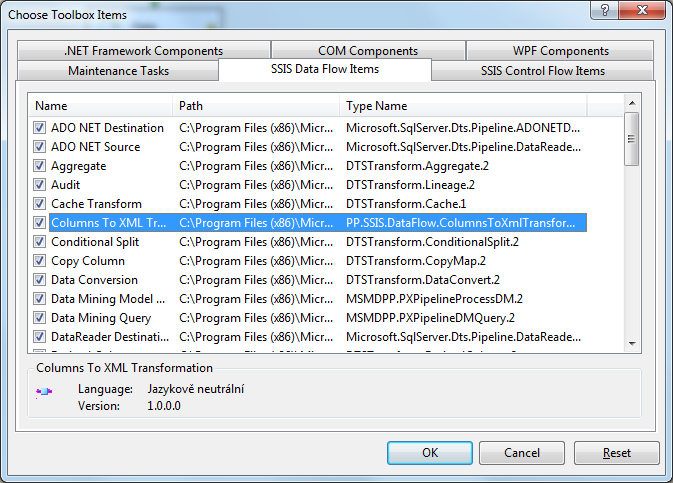 So the SSIS Data Flow with the Custom Columns to XML Transformation could look like the one below. You can provide a SourceID and SourceName properties which are then part of the produced XML so you can easily identify the source. In the Input Columns you select columns you want to be written to the XML. You can also specify an OutpuAlias and the the column names written into the XML will be the one specified in the OutputAlias property. The Log written using that component and the XML produced will look like the ones below. As you can see from the samples above, you can create easily create single Error table for whatever ETL logging and simplify the logging rapidly as you#160; do not need to create the error tables with separate structures for each source. The ColumnsToXmlTransform is a custom implementation of the PipelineComponent. It is developed in C# for .NET framework 3.5 and uses Linq to XML for creating the XML output. The component processes selected input columns, generates the XML and stores it in the output column called ColumnsXMLData. Except the ColumsXMLDataSourceID and SourceName) to allow you to identify the source row source once it is written as XML into the database and simplifies querying for data coming from particular sources as showed above. Once the component is built, it is necessary to install it into the Global Assembly Cache and to the PipelineComponents folder in the SQL Server Integration services installation path on the machine on which the SSIS using this component will be running. To install it into a GAC you can use the gacutil.exe which is part of the Windows SDK. Component is now available publicly with other components on GitHub as projects for SSIS 2008 – SSIS 2016. If you run the development environment as with elevated Administrator privileges, the project contains Post Build events, which will install the assembly into the GAC (it assumes you have Windows SDK 7.0 installed – if you have newer version, modify the path to the gacutil.exe accordingly) and also copies the assembly into the codePipelineComponents/code folder of the default SQL Server Integration services installation. If you installation directory differ, please modify the paths in Post Build events accordingly. Once you select the component, it will appear on the toolbox and you can start using it. Once I will have more time, I will try to create an installer for the component. Anyway, any comments are welcome. Sometimes you can come to situation when you need to read data from SharePoint and store them in database on SQL Server. These components work very well for the SharePoint List. Unfortunately you will have no success using them for reading data from the SharePoint Survey, although the structure of the data are nearly the same as for list. Simply these components doesn’t support Survey data. Also it can happen, that you cannot install any third party component you your server and therefore you cannot use the SharePoint List Source and Destination components. In that case you can use a script which will extract the XML data out of the SharePoint and you have two possibilities how to handle the XML. You can save the XML file to some temporary location and then process the XML file using the XML Source in the Data Flow task to read data from it. You can process the XML inside the Script Component in the Data Flow task and direct records to corresponding output. To retrieve the data you can use a below class snippet (C#), which you put into your Script Component or Scrip Task. As mentioned above put this class as part of the Script Component or Script Task and use the static method SharePointDownloader.GetSharePointListXml method to retrieve the XML data. The function takes as argument an URL which points to the list/survey you need to download. You can retrieve this link from the .igy file which you get, when you select Export To Spreadsheet action in the SharePoint. Instead opening the file in excel you choose to save it and retrieve the URL from this file. It is necessary to mention the assignation of the ServerCertificateValidationCallback property of the ServicePointManager class to a newly created internal class, which simply returns true. This is necessary to avoid problems with certificates. The code snippet also uses the DefaultNetworkCredentials which represents credentials of the account under which the SSIS package will be executed. You can eventually provide other credentials if necessary. One very important thing related to this snipped is, that in case of downloading Survey data, the account under which the code will be executed needs admin rights to the Survey in SharePoint, otherwise it will have no access to the complete list of responses in the survey. Once you save the data to a temporary destination, you can connect to the xml file using the XML Source in the Data Flow Task. What you will need is to generate the XSD schema from the XML source and keep that XSD schema for future use as in case of any other XML file which needs to be imported by SSIS. If you would like to process the XML in the Script component, again you simply put the code inside the Script component, retrieve the XML and then go through the XML programmatically and direct the data to appropriate output of the script component. Of course you can make some fine tuning for the script component to avoid double processing of the file use the core of the GetSharePointListXML and redirect the data directly to and output of the script component when processing the nodes in that part.